Redfern is an inner-city suburb of Sydney located 3 kilometres south of the Sydney central business district and is part of the local government area of the City of Sydney. Strawberry Hills is a locality on the border with Surry Hills. The area experienced the process of gentrification in recent[when?] years. Redfern was subject to extensive redevelopment plans by the state government, to increase the population and reduce the concentration of poverty in the suburb and neighbouring Waterloo (see Redfern-Eveleigh-Darlington). The suburb is named after surgeon William Redfern, who was granted 100 acres (0.40 km2) of land in this area in 1817 by Lachlan Macquarie. He built a country house on his property surrounded by flower and kitchen gardens. His neighbours were Captain Cleveland, an officer of the 73rd regiment, who built Cleveland House and John Baptist, who ran a nursery and seed business. Sydney's original railway terminus was built in Cleveland Paddocks and extended from Cleveland Street to Devonshire Street and west to Chippendale. The station's name was chosen to honour William Redfern. At that time, the present Redfern station was known as Eveleigh. When Central station was built further north on the site of the Devonshire Street cemetery, Eveleigh station became Redfern and Eveleigh was retained for the name of the railway workshops, south of the station. 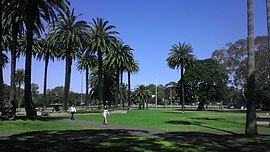 The remains of Cleveland Paddocks became Prince Alfred Park. In August 1859, Redfern was incorporated as a borough. The Municipality of Redfern merged with the City of Sydney from 1 January 1949. Redfern has been characterised by migrant populations that have lived in the area. In the late 19th century many of the businessmen in the area were from Lebanon such as George Dan 1890, Stanton and Aziz Melick in 1888 and Shafiqah Shasha and Anthony and Simon Coorey in the 1890s. As waves of immigrants arrived in Australia, many made Redfern their first home. On 17 January 1908 at Redfern Town Hall the South Sydney club was formed to compete in the first season of the New South Wales Rugby Football League Premiership. Liquidambar styraciflua trees were planted in Baptist Street in the 1960s and 70s. The notorious Redfern Mail Exchange was built in 1965, after 300 people were evicted from their homes on the 2.15 hectare site. It became the scene of many industrial disputes when the automatic mail-sorting machinery which was supposed to sort efficiently, actually destroyed many letters. It became known as the Redfern Mangler. The 2004 Redfern riots began on 14 February 2004, at the end of Eveleigh Street outside Redfern station, sparked by the death of Thomas 'TJ' Hickey. The teenager, riding on his bicycle, was allegedly being chased by a police vehicle, which led to his impalement on a fence. Members of his family were then reported to have started grieving for TJ around Eveleigh Street with a crowd gathering commiserating with the family. Fliers were distributed blaming police for TJ's death. The police closed the Eveleigh Street entrance to the railway station, but youths in the crowd became violent, throwing bricks and bottles; this escalated into a riot. A subsequent inquest found that although the police were following Hickey, they had not caused the accident, a verdict that caused controversy in Redfern's Indigenous community. The riots sparked fresh debate into the welfare of Indigenous Australians and the response of the police to those living in the Redfern area. The main shopping strip is located on Redfern Street, east of Redfern railway station. There are also commercial developments nearby, along Regent Street and surrounding streets. The Redfern skyline is dominated by two office towers and two residential blocks located between Regent Street and Gibbons Street, beside Redfern railway station. Redfern railway station, located on the western edge of the suburb is a major station on the Sydney Trains network. Redfern is the first station south from Central Sydney terminus on the edge of the city. Redfern station is the closest station to the main campus of the University of Sydney at Camperdown and Darlington. A near-constant stream of commuters, mostly students, flows from Redfern station along the south side of Lawson Street towards the university in the morning, and back towards the station in a largely hourly rhythm in the afternoon. St Vincent de Paul Catholic Church is on Redfern Street. St Saviour's Anglican Church (which is also known as one1seven church) is on Young Street. St George Antioch Orthodox Church is on the corner of Walker Street and Cooper Street. The Greek Orthodox Church in Cleveland Street is called the Cathedral of the Annunciation of Our Lady, formerly St Paul's Church of England built in 1848 and designed by Edmund Blacket. The St Andrew's Greek Orthodox Theological College sits beside it. Hillsong Church's city campus is at 188 Young Street. There is also another cathedral, the St Maroun’s Cathedral for the Lebanese community. The population of the suburb spans a broad spectrum of socioeconomic characteristics. This may be partly due to the geography of the suburb, which is long, narrow, and centrally located. Redfern has become increasingly gentrified, with many medium and high density developments replacing low density and industrial developments. According to the 2016 census, Redfern has a population of 13,213 people, with Aboriginal and Torres Strait Islander people making up 2.1% of the population. 52.2% of the population were born overseas. The most common countries of birth were England 5.1%, China 4.7%, New Zealand 3.3%, United States of America 1.6% and Ireland 1.1%. 61.7% of the population only spoke English at home, with the most important other languages being Mandarin (4.1%), Cantonese (2.5%), Spanish (2.3%), Russian (2.0%) and Greek (2.1%). 45.5% of the population marked no religion, higher than the national average. Of the remainder, 16.0% were Catholic, 6.1% Anglican and 3.6% Buddhist. 'The Block' is an area in the immediate vicinity of Redfern station bounded by Eveleigh, Caroline, Louis and Vine Streets. The Aboriginal Housing Company (AHC) was set up as the first urban Aboriginal community housing provider, using grant money to purchase the houses on the Block. As a result, the area is important to the Aboriginal community. Eveleigh Street, which is part of 'The Block', is well known for its community. In 2004 much of the housing here was demolished with plans for redevelopment, but it is still an area around which many people congregate. The AHC's plans for redevelopment are known as the Pemulwuuy Project. The plans were approved in 2009. Redfern has many fine examples of Victorian terraced housing similar to other inner suburbs, such as Surry Hills and Paddington. Also, like some other inner-city suburbs, some parts of Redfern have been gentrified, whilst other areas still project an image of "mean streets", with some public housing. A number of well-known sporting teams represent the local area. One of them is the well known NRL club named the South Sydney Rabbitohs and one of the oldest Aboriginal rugby league teams in Australia the Redfern All Blacks who play at Redfern Oval. The Redfern Raiders Soccer Club is the local Junior Soccer Club. Redfern Gym opened in 1985 and many boxing world champions have trained there. The 2011 Australian drama series Underbelly: Razor and 2012 Australian drama series Redfern Now were filmed on location in Redfern. ^ a b Australian Bureau of Statistics (27 June 2017). "Redfern (State Suburb)". 2016 Census QuickStats. Retrieved 2 July 2017. ^ Moore, Matthew. "Transforming the great southern land". Retrieved 19 January 2014. ^ "Cathedral of the Annunciation of Our Lady". New South Wales State Heritage Register. Office of Environment and Heritage. H01881. Retrieved 14 October 2018. ^ "Redfern Aboriginal Children's Services and Archives". New South Wales State Heritage Register. Office of Environment and Heritage. H01951. Retrieved 18 May 2018. ^ "Eveleigh Chief Mechanical Engineers office and movable relics". New South Wales State Heritage Register. Office of Environment and Heritage. H01139. Retrieved 18 May 2018. ^ "Eveleigh Railway Workshops". New South Wales State Heritage Register. Office of Environment and Heritage. H01140. Retrieved 18 May 2018. ^ "Eveleigh Railway Workshops machinery". New South Wales State Heritage Register. Office of Environment and Heritage. H01141. Retrieved 18 May 2018. ^ "Redfern Railway Station group". New South Wales State Heritage Register. Office of Environment and Heritage. H01234. Retrieved 18 May 2018. ^ "Fitzroy Terrace". New South Wales State Heritage Register. Office of Environment and Heritage. H00083. Retrieved 18 May 2018. 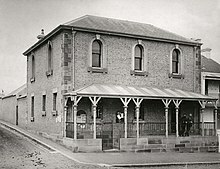 ^ "Redfern Post Office". New South Wales State Heritage Register. Office of Environment and Heritage. H01439. Retrieved 18 May 2018. 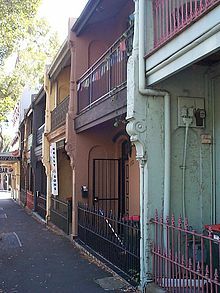 Wikimedia Commons has media related to Redfern, New South Wales.